The adage that "children are not little adults" applies when considering sports injuries. Open physes in long bones and apophyses at tendon attachments to bone provide weak links through which acute and repetitive overuse injury can occur. These growth centers usually close within defined age ranges throughout adolescence, but significant variation between individuals exists. Thus, physeal and apophyseal injury must always be considered when evaluating children or adolescents with musculoskeletal complaints. Physeal fractures are common and must not be missed, because growth arrest can occur if they are not recognized and treated appropriately. The diagnosis of an ankle or knee sprain in a young adolescent with open physes should only be considered after physeal injury has been ruled out. Acute physeal injuries and the Salter-Harris classification system are addressed in greater detail in Chapter 30. Overuse injuries are increasing in frequency in pediatric athletes, with the most common being articular cartilage injuries (osteochondritis dissecans), chronic physeal injury, and apophysitis. 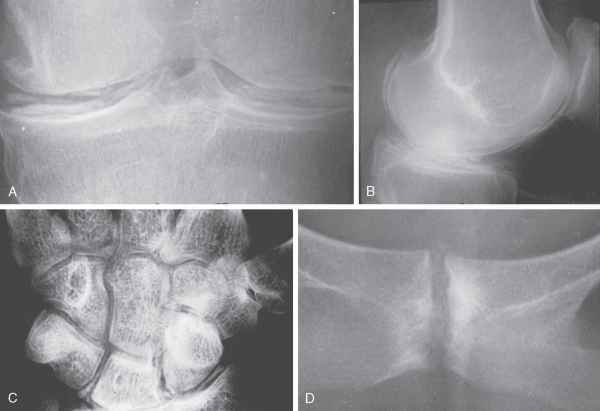 Osteochondritis dissecans (OCD) involves a focal loss of cartilage and the underlying bone fragment and may be idiopathic or associated with overuse activities. Apophysitis is the pediatric equivalent of tendinopathy in adults. The growth center at the tendon-bone interface is susceptible to injury similar to that sustained by the physes of long bones. Risk factors contributing to the development of pediatric overuse injuries include overtraining; strength and flexibility deficits somewhat inherent in bone and soft tissue development; prior injury with inadequate rehabilitation; faulty technique, often resulting from poor coaching; and excessive pressure from adults to train and perform. The diagnosis is usually straightforward and requires a familiarity with the demands and common overuse injuries of that sport (Lord and Winell, 2004; Thordarson and Shean, 2005). Table 29-2 lists common apophyseal injuries in pediatric athletes. The treatment of OCD varies according to location, but the offending activity should be stopped immediately and the upper extremity joint immobilized or the lower extremity joint made non-weight bearing. The patient should be referred to an orthopedist for further management, which may involve prolonged rest with radiographic follow-up, reattachment of loose fragments, or removal of fragments with drilling or grafting of joint surfaces. The treatment for chronic physeal injury or apophysitis consists of initial rest, followed by rehabilitation directed at improving flexibility and strength, then a gradual return to activity. Parents and young athletes should be counseled that low-level recurring symptoms can be expected until growth plates have closed, but that escalating symptoms should be managed with rest and physician follow-up. The most challenging aspect of treatment is ensuring proper coaching, educating parents regarding appropriate levels of participation and competition for children, and having adults accept reasonable limits for childhood participation in sports.